Or, get it for 42400 Kobo Super Points! 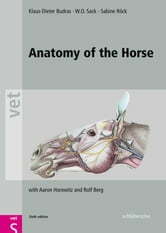 Anatomy of the Horse has been accepted as a highly successful text-atlas of equine anatomy. - Fully illustrated with color line diagrams, including unique three-dimensional cross-sectional anatomy, together with radiographs and ultrasound scans - Includes topographic and surface anatomy - Tabular appendices of relational and functional anatomy Already acknowledged by students and teachers as an essential resource for learning and revision, this book will also be a valuable reference for veterinary practitioners and for those who own and value horses.